We are proud to offer our residents and family members Ebenezer's Dimensions program. The Dimensions Programs® prepares our staff to provide exceptional, compassionate care using evidence-based best practices. Our Dimensions Coordinator oversees the multi-faceted program. Our goal is to make a dramatic difference in the life of your loved one. The production of the video was funded by the Ebenezer Foundation’s “Greatest Needs Fund.” Guided and directed by Marysue Moses, Ebenezer’s Dementia Care Coordinator, the video will be a resource to families with loved ones dealing with memory care issues and what they can expect. 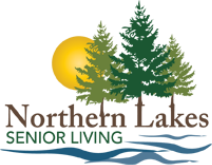 Northern Lakes Senior Living offers private memory care studio apartments designed to support seniors with dementia, Alzheimer’s disease and other forms of long-term memory loss. Staff members are trained and educated in the most up-to-date memory care practices that provide residents with comfort, tranquility and a sense of familiarity. Our Memory Care is specifically designed to accommodate those who wander or become easily disoriented, and our dedicated Memory Care staff offers choices for personal care, and medical services. We provide care that caters to the total well-being of your loved one and have created memory care programs and activities to meet those needs. The staff at Northern Lakes Senior Living understands clinical diagnoses and therapeutic goals and incorporate these into recreational therapy to enhance the physical, cognitive, emotional, social, and leisure needs of residents. The Memory Care at Northern Lakes Senior Living is a place to celebrate each senior’s individual personality in a supportive environment. Our memory care has an outdoor garden courtyards, and residents enjoy family style dining and living areas. Northern Lakes Senior Living partners with Fairview Health Services, the University of Minnesota, and the Alzheimer’s Association to offer cutting-edge programs. For more information about our Memory Care apartments or services call 218-454-2121 ​or complete the form below.